So while HBO don’t have to resort to publicity stunts to create a buzz, if they are going to anyway, they may as well make it a good one. With this epic, global scavenger hunt to delight the traveler in all of us, you gotta say they have succeeded! Because if there’s one thing we all love, it’s searching for something. From Easter Egg hunts to those Monopoly things they used to have at Mcdonald’s, nothing gets people more excited than a game of hide and seek. 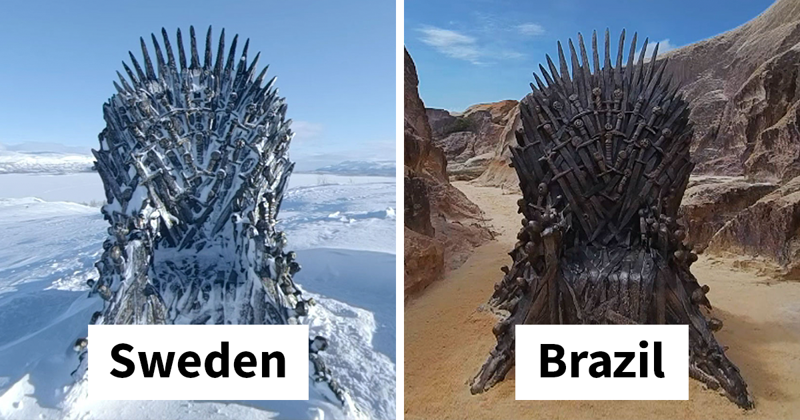 HBO decided to take the concept to the extreme by scattering 6 iron thrones in secret locations around the world, offering tantalizing clues in hour-long, 360-degree videos of their locations. One is in a forest, another appears to be in a desert somewhere. There are also a couple in icy locations, with very few landmarks around which could help to identify the area. Imagine stumbling across one, without knowledge of the show or any context?